I'm mad. I'm an idiot. I'm a fool. I'm a tryhard. I'm a dipstick. I'm an Australian. There you go, please feel free to say whatever you like, I'm prepared. 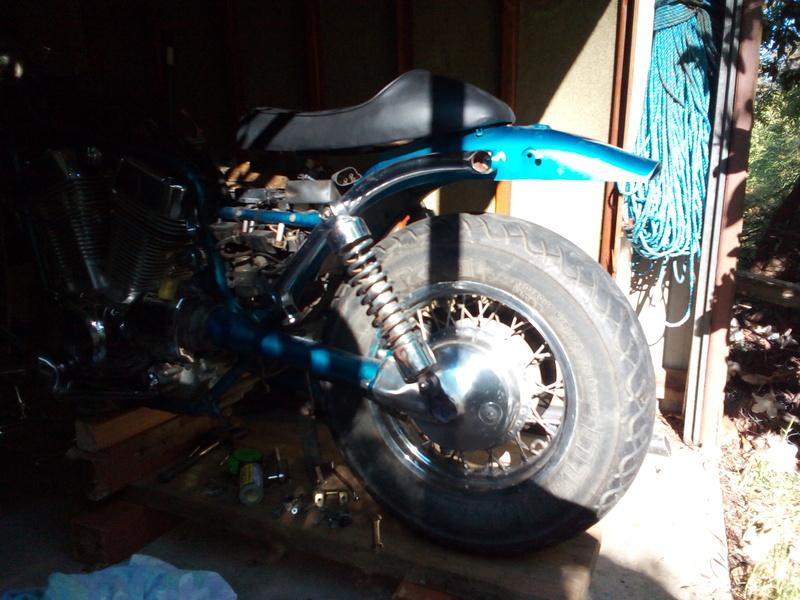 This project is to convert my Suzuki Intruder VS1400 into a neat bike. 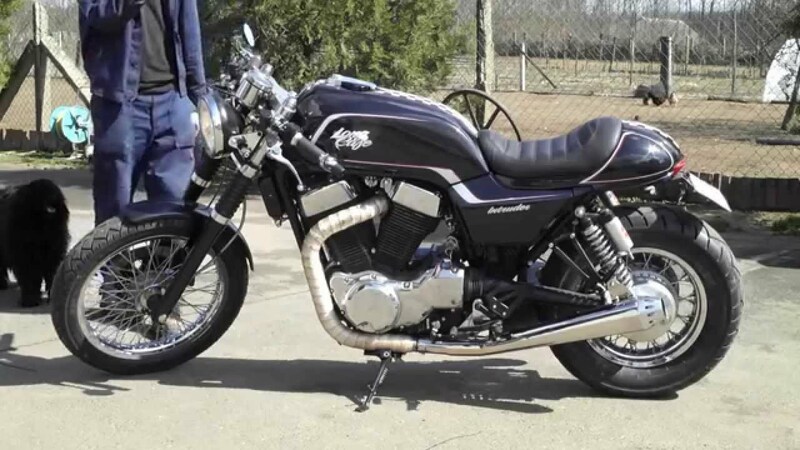 Not a chopper, or a bobber, tracker or a street fighter, the closest breed to my vision is a cafe racer. Well I'm 63, so that figures. Certainly it's a challenge, but not impossible as I've been told. Time will tell. In 2010 after being thrown onto the industrial scrap heap, instead of looking for another job and despite calls of 'please come back' from my wife and 'the Taliban will get ya' from everyone else, I headed off on an around the world motorbike trip. I got as far as the UK and fell in love with the Isle Of Man. The cost of freight across the Atlantic is more than the bike is worth so bingo. Every winter I now head north. Subtle, functional, fun, safe. Nothing ridiculous or outrageous. I want it to be recognized as an Intruder, the steering head angle will stay as is, but the forks shortened a bit if ground clearance permits, slightly longer rear shocks, a bigger front disc, definitely a 4 piston caliper, rubber fork boots, front mudguard will most probably stay as is, the rear mudguard will be trimmed or replaced, tank replaced with something flatter and longer, flat bars and a higher flatter seat with a pillion cowl and the pegs rear set. The exhaust will be replaced, perhaps 2 into 1, but with curves, not like the existing straight sections. Smaller indicators, a paint job, that's about it. I fly to the UK next week, pick up the bike in Sussex and ride it back to IOM via Heysham and get started, a piece of cake. I've got another bike on IOM, so I've got all the time in the world, well, my share anyway. pwalo and DohcBikes like this. Hey Mark, Post a pic of what might look similar to what you want. Like I dunno peraps this. I would ride an intruder gussied up to look like a Norvin. Nothing wrong with that..
Having owned and put quite a lot of miles on a vl1500 I would say don't change it, but the 1400 is quite a different beast. I always thought they looked a bit squashed up as they have a shorter frame than the 1500, but still they are pretty good bikes for what they are - which is a low rider type of cruiser. In the end it's your bike but from what you are telling us about what you want it to be I think you are starting with the wrong platform to modify. 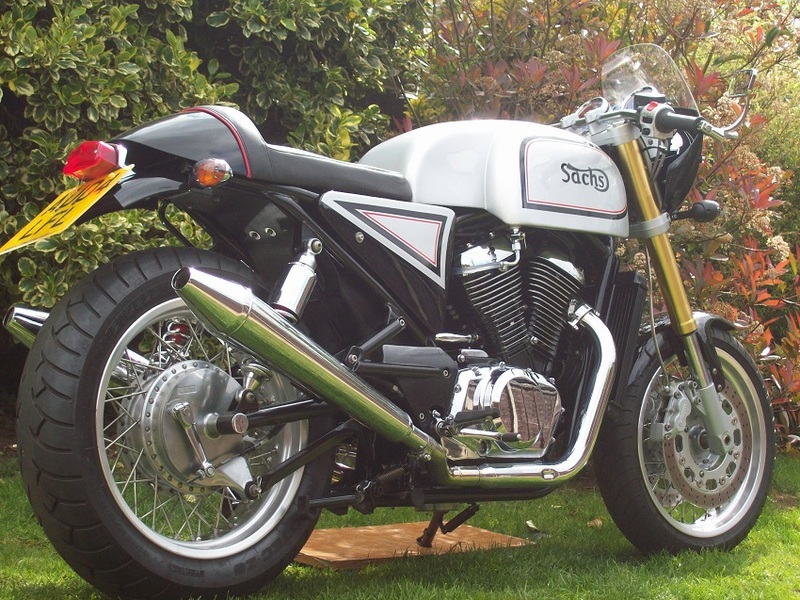 The Sachs pictured above is probably the best modified bike with your engine, but the frame is quite different and the bodywork is custom.....and really well done. Hi, thanks for the replies and sorry for the delay, I've been busy. In August I rode the Intruder from Sussex back to the Isle Of Man and started the project. On the way I called in to Devizes to check out the canal locks and narrowboats, I'm interested in that sort of stuff. A few miles outside Devizes a dairy farmer drives his herd along the road to the dairy and I came along just after. Fair dinkum, the cows must have been grazing in a lush pasture because it was all over the road, it would have been counter productive to swerve to miss it, I would have wiped the road with my back. The good news is that it re-enforced my belief that a road bike needs mudguards and air filters. With this fresh in my mind, my 1st modification was the rear mudguard. I've trimmed off the duck tail, about 1.5" and about 1" off the sides. I will post photos when I learn how. I'm back in Australia now and realised I had a problem. 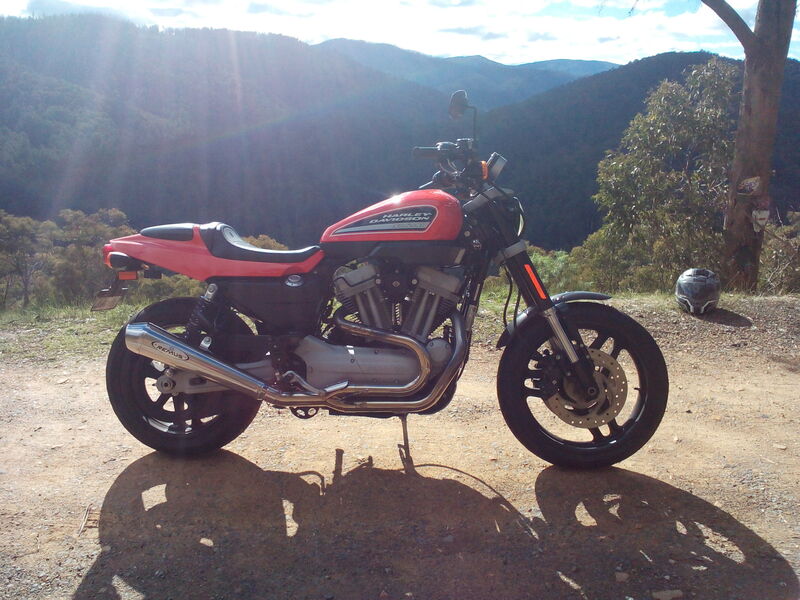 How can I make the custom parts, particularly the tank and exhaust, for a bike on the other side of the world. The answer was obvious, buy another Intruder here. So now I have 2 identical projects, but there will be slight differences, the IOM bike will be black and the Oz bike will be white, so that sorts out their names, Ebony and Ivory. I've been busy buying bits and pieces on eBay, I'm their best customer, I didn't realise retail therapy was such fun, and it has me buggered how China can do it at the prices they charge. I could not find a suitable front disc, so I've bought Moto Guzzi 320mm discs which are pretty close and they are with my brother who has an engineering workshop. The bolt pattern radius is 1mm bigger and the ID is 7mm bigger so a centering ring is required. Luckily, the Intruder bolt holes are bigger so when they are drilled out at the required pattern radius all will be sweet. I have to scout around the wreckers for a couple of 4 piston calipers and make an adapter to fit the fork. I've bought a 2nd hand Tig, it's going to be fun extending the tank and building a new exhaust. I was surprised when I removed the headers to find an inner pipe, only 1.5" diameter. This got me reading up about exhaust design, gas scavenging and free flow and vacuum reflected waves and all that jazz. Plus the length of the 2 headers is different, go figure, the front cylinder header is 74cm and the rear is 88cm. I'm thinking of making both headers the same length of about 60cm, going into a 2 into 1 collector, from there on a 2.5" diameter pipe and muffler. I'm thinking of slightly increasing the diameters of the headers after the first 6"" to 1 5/8", perhaps 1 3/4". I would appreciate any advice. Increasing the diameter of the exhaust pipes may lesson the back pressure and torque of the motor. Here is a photo of the trimmed mudguard. I thought I got it figured on the header length, but I haven't. The cylinder separation is 315 degrees, so lengths of 630mm and 720mm seem OK. This is close to the after markets pipes on my HD XR1200. I've just checked the HD crankshaft configuration and it's dïfferent so is irrelevant. Last edited by MarkHarold; 11-16-2016 at 04:01 PM.